The expansive sky and splashes of bright colours stir my memory. One year to be exact and I am back in the village of Aru, Democratic Republic of Congo. What has changed? That is the first question that comes to mind, but maybe it would be better to ask how does one define change? What does it truly mean to change? It brings to mind the poem by Shelley Ozymandius about the ruins of an empire where all that remains are broken statues of people that once ruled the land and temples that stood tall. This realization came to me that whether or not buildings have been built or not, or whether they have deteriorated or improved, it does not really matter in the end. All things will fall apart and crumble to the ground and all that is left is the story that is left behind. It is the lives we live that leave a mark behind and the presence that always rests in that place. Just like the words of one of the Sisters here in Aru who shared with me that it is not what you give the people but what matters is that you are there. These words were in reference to a visit to the prison here in Aru, where this Sister shared how one group of young people came carrying bread and other items to the prisoners and were so concerned about how they would present this gift and how much to bring that they overlooked the fact that to the prisoners it did not matter to them what they brought but that they came. To be present is truly a gift that we often overlook. It has been beautiful to be remembered by so many people here in this village of which I thought after one year I would be forgotten. I am very thankful that my goal in coming was not only to “see” improvement and development but also to be among the people, to be with them and to share in some way in their lives even if only for a short time. The lives of the people here unfortunately have not changed much. A few people have continued their studies either in Aru or elsewhere , many graduates from the secondary school have no work and remain in Aru doing nothing and the rest have either kept their past job or left Aru to search for employment. There have been a few changes which have given me hope and that is to see the locals here taking over the work that the volunteers here had originally set up. For example, the library here in Aru was built, funded and organized by the volunteers with help from the locals. Now the library is run solely by the Congolese which is amazing to see. It is Aru’s first library so the concept has not quite caught on yet, but hopefully people will soon start to appreciate and understand the beauty of a library. In terms of change in the development sense of the word Aru has made baby steps but progress all the same. The library is finished, another classroom has been added to one of the primary schools, a new convent has been completed, a maternity ward has almost been completed at the health centre, there is a new cyber café, prison, bank, offices and entrance to one of the high schools, and a new police office. The most interesting change has been the free electricity that Aru has been benefiting solely from the past elections. A few days before I arrived Aru’s forlorn power lines along the road finally were put to use and have been in full use up to this point. My inclination is that after December 6th when the results of the national election have been announced the electricity will be cut. Other positive changes in Aru have been, as I mentioned above the library being run by locals, as well as the bakery fully operated by the locals. The farm where Clara, a lay missionary, works has begun selling chickens and their eggs as well. The chicken farm is looked after by a local who also has learnt how to drive the tractor here and has taken on other responsibilities (such as President of Arustan, haha…but that is a whole other story). Clara has really pushed hard and fought to improve people’s situations here by finding work and creating opportunities. Her goal is for the people here is for them to have dignity in their work and not just have them rely on begging others to help support them. In the end, what will have been achieved? They will not have learnt anything or gained any dignity if everything is handed to them. In order to create work for the people here one has to really fight for it. The mentality of the people here is that if things have been working fine why bother to change anything; their vision is very narrow minded which makes it difficult to bring in new ideas such as a library for example. Words often fall on deaf ears and despite the number of times you try to explain to people your reasoning it will never get through to some people; this is a constant occurrence here in Aru and as a westerner you need to learn how to work through this. There has been another step towards progress here which started with an American volunteer named Katie. She has started a project called Totonga Bomoi – Build Our Future- with the purpose of empowering Congolese women through the fabrication of handbags. It is a beautiful project and I plan to promote this project when I return to Canada and display the already made handbags by the women here. This has been an amazing step forwards, but to get things off the ground it takes a lot of perseverance and I commend Katie immensely for her dedication to starting this up. There of course has been the flip side of the coin which is the lack of development and change here and I will not try to avoid confronting them. The most difficult reality to face is when you cannot do anything to change a situation. I finally came to the realization that I cannot change the way a mother treats her child and sometimes one has to walk away from a situation and pray that God will take it in His hands. My only thoughts consist of, “I will never treat my child that way,” and “every child deserves to be treated with respect and given the opportunities to learn.” Another difficult reality to face is to see one’s work derelict and looked after by no one. Unfortunately many projects that commenced during my time last year now have no one to follow them. There is a great disappointment felt with this and I cannot begin to point fingers at who is to blame but can only appreciate it for what it once was. For example, the soccer field and the volleyball court that were built are never used, my clinic at the health centre is non-existent, physical education class also does not exist anymore for the high school girls, the house I painted is not being used and a few other little things. Many contrasting emotions have arisen during my week stay here in Aru; it has been difficult and amazing to be here all at the same time. New things have been revealed to me and other things confirmed. I am sad to leave again the people here in whom I have invested in and I have thought to myself, “ maybe it would have been better not to have come and visited at all because it is terrible to be among people whom you care for and a place that you hold close to your heart and then have to leave?” But I think back on the words of one of the Sisters who said that one need to open the door of our heart not just to the people who live around us but to the whole world, to wherever God calls us to love. Every encounter here was for a reason and there was a design behind it all. The African sun continues to rise and fall and in the end all that matters is that we love one another. 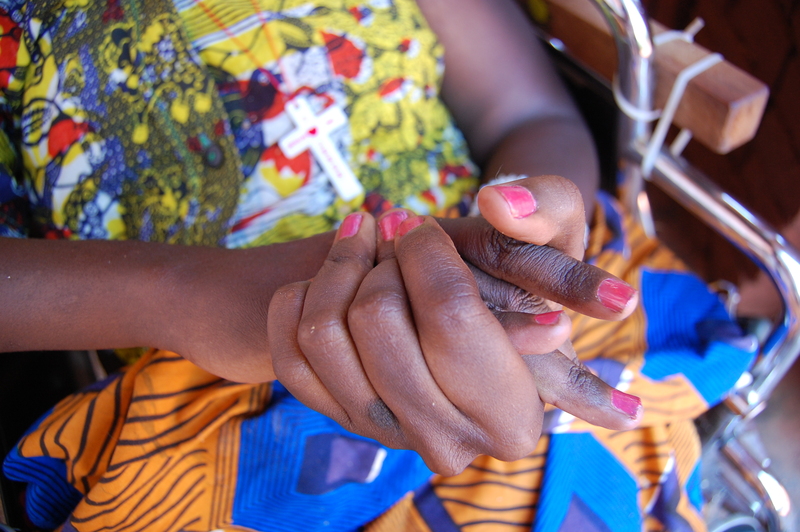 The first photo is of a girl named Mado who is disabled and whom I would visit weekly. The photo shows the beautiful nail polish we did together! 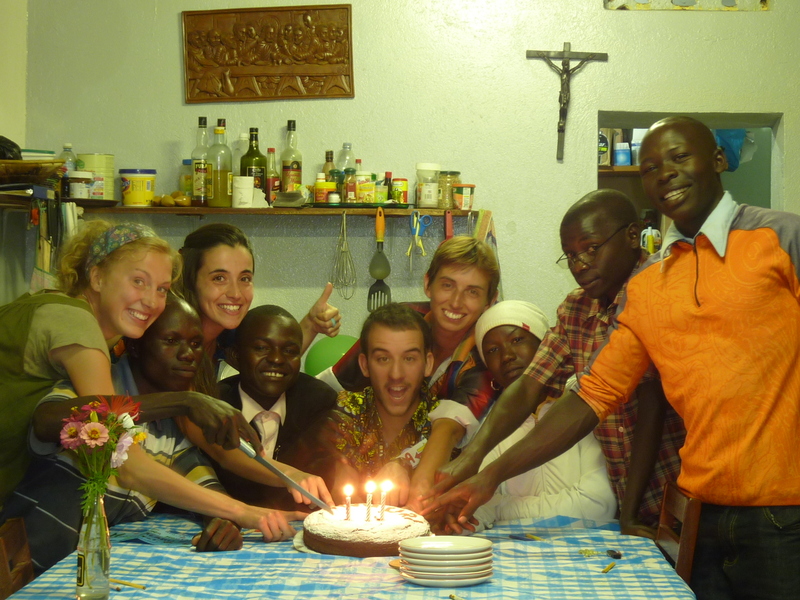 The second photo is of the volunteers who are here now with my dear Congo Crew all together for the birthday of one of the volunteers Daniele. Lydia, it is always difficult to go back to the experience of a life time and revisit. Your words are wise and do realize it was you who brought about some of the changes for having been there. It was your joy and encouragement that will remain in the hearts of those you have touched, not the buildings or the material changes that were made in the process of your efforts. Great job and look forward to seeing you very soon! Safe journey home.